Proprietary Name: Medicrave What is the Proprietary Name? Non-Proprietary Name: Arnica, Caladium Seguinum, Lobelia Inf, Petroleum, Tabacum What is the Non-Proprietary Name? 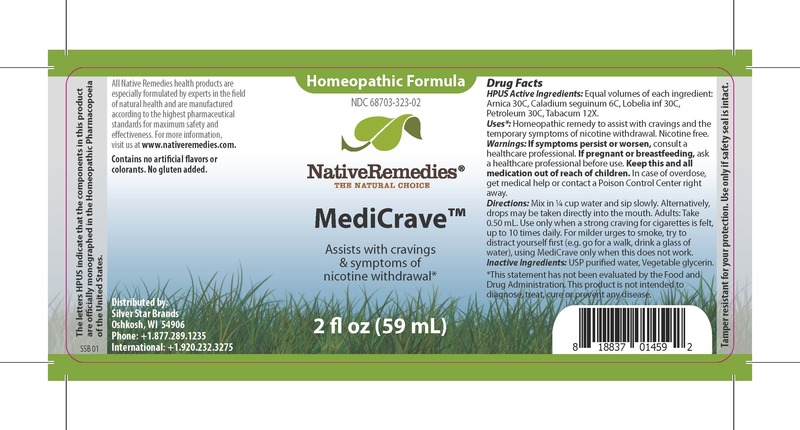 Medicrave with NDC 68703-323 is a a human over the counter drug product labeled by Silver Star Brands. The generic name of Medicrave is arnica, caladium seguinum, lobelia inf, petroleum, tabacum. The product's dosage form is liquid and is administered via oral form. HPUS Active Ingredient: Equal volumes of each ingredient: Arnica 30C, Caladium seguinum 6C, Lobelia inf 30C, Petroleum 30C, Tabacum 12X. Uses*: Homeopathic remedy to assist with cravings and the temporary symptoms of nicotine withdrawal. Nicotine free. If pregnant or breastfeeding, ask a healthcare professional before use. Directions: Mix in 1/4 cup water and sip slowly. Alternatively, drops may be taken directly into the mouth. Adults: Take 0.50 mL. Use only when a strong craving for cigarettes is felt, up to 10 times daily. For milder urges to smoke, try to distract yourself first (e.g. go for a walk, drink a glass of water), using MediCrave only when this does not work. Inactive Ingredients: USP purified water, Vegetable glycerin.